Bourne Legacy gives us a lot of good for being sans Matt Damon. Jeremy Renner holds his own very well and proves he can be a leading man in a blockbuster. Starting off prior to the events of The Bourne Ultimatum, Legacy finds Jeremy Renner’s character in the Alaskan wilderness, being hunted by a pack of wolves. Then, all of a sudden, he discovers that a drone is trying to blow him up. Eventually, the film moves past Ultimatum and becomes about another secret government agency. They’re feeling threatened by Jason Bourne’s uprising and trying to kill their own assets before they have the chance to retaliate. The biggest issue with this film is that it tries to be cryptic. It’s capable of telling us what’s going on, but chooses not to–which can be frustrating when watching a movie. You can tell that these events are opening the door to something cool in the series, but it just doesn’t let us figure out what that is until later. Often times, we find ourselves scratching our heads, hoping that it all ties together in the end. And it does for the most part. But even when things click, it means nothing of value. You just accept it and hope it will make sense in the next film. We’re also never entirely sure how it all connects to the Bourne series–other than the same people are involved. But the glimmering hope that it’s going to open the series up to something grander–the bigger picture–makes every piece of this film intriguing. Regardless of the mysterious plot, it’s really entertaining. The action and chase sequences are high-quality, and there are some really intense scenes. It’s all fun in the end. While not quite as memorable as some of the other geriatric-themed movies of the past, The Best Exotic Marigold Hotel still manages to pass along a plethora of nice messages to the audience members that need it the most. It individually explores the situations of several pre-octogenarians and why they have all come to stay at the same hotel in India. Whether it’s to find love, to rediscover themselves, or to find themselves for the first time, the trip is life-changing for everyone involved. The movie eventually brings it all back around to the two twenty-year-old characters who are trying to dodge their families’ mutual disapproval of their love. The film starts off very slow and we are overcome with the anxiety of their eventual arrival to India. Although at first it’s unclear why certain characters are leaving their homes at all. And like many ensemble films, the tone gets mixed and matched a lot along the way. At times it has a hard time balancing all of the characters’ stories–which may attribute to the long runtime–but it still manages to portray so much of their depth. Yet two of the characters’ stories remain slightly unexplored, but it may have been deliberate. This film might fly over the heads of the younger viewers. And perhaps it’s meant to. 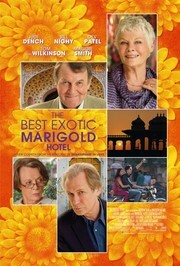 And while The Best Exotic Marigold Hotel may surpass it’s niche at some points, it’s just as classically heartfelt as the best films of this genre.